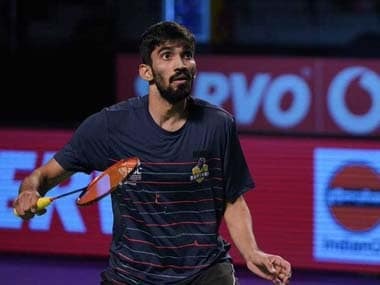 New Delhi: Saina Nehwal scripted a sensational comeback win over Canada's Michelle Li to guide Awadhe Warriors to a superb 4-3 victory over newcomers North Eastern Warriors in the third Premier Badminton League (PBL) on Saturday. The Lucknow-based team, who had opened their campaign with a 4-3 win over defending champion Chennai Smashers in the PBL opener at Guwahati, continued their rampaging run, winning the first three matches -- including their Trump match -- in the five-match duel to take an unassailable 4-0 lead. World No 10 Saina, who clinched her 2010 Commonwealth Games gold medal at the same venue, continued her love affair at the Siri Fort Sports Complex with a 6-15 15-13 15-13 triumph over world No 21 Li, who is interestingly the reigning Commonwealth Games champion. North Easterns then pinned hopes on men's doubles pair of Kim Gi Jung and Shin Baek Cheol and the duo completed the proceedings with a 15-10 15-12 win over Setiawan and Tang Chun Man in their Trump match to narrow the deficit to 3-4. Saina left one at forecourt and hit long to hand over the lead to Li. A body smash saw Saina make it 13-13. Another engrossing rally and Li's drop shot hit the net to give Saina the match point.